Great furniture and very comfortable and sturdy. The chairs came in separate boxes and at different times. There was a chair missing and a new one was sent out right away. 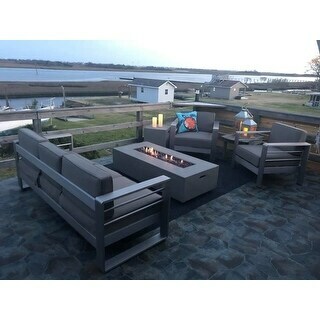 Enjoy sitting around the fire with your family and friends with this seating and fire table set. Complete with four club chairs, a three seater loveseat, and fire table. 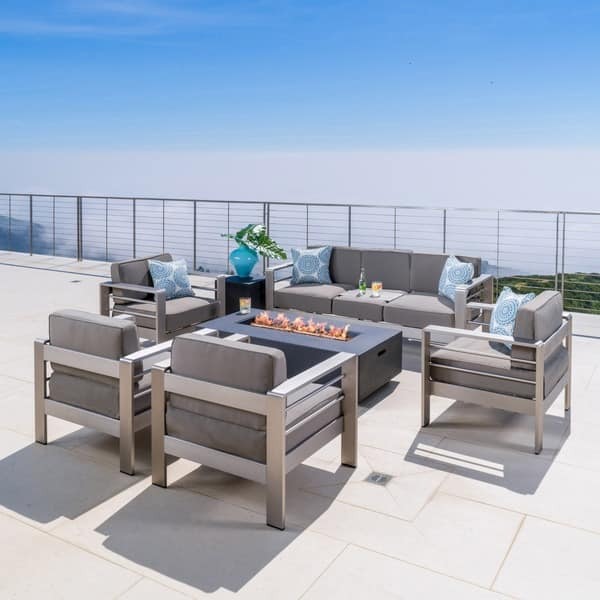 The club chairs and love seat feature a top quality aluminum frame that has been treated to withstand the elements and extra plush water resistant fabric cushions for maximum comfort. The fire table is made with sturdy magnesium oxide to last you for years to come. VERY nice set.. Had some trouble with a few of the bolts in the chairs but all and all easy to put together. Very comfy and a lot of pieces for the price below pic is not showing two of the chairs will only use them when having more company. Love that we can separate and spread the seating out. Had a St. Patty's party and it was a hit!! Oh and the fire pit puts off a great amount of heat. 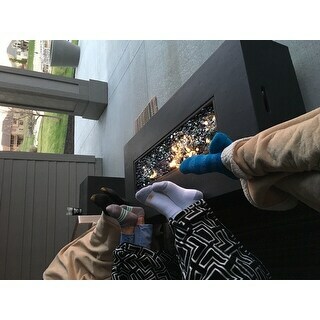 Our house is waterfront so can be chilly air coming off the water.. this knocked it out perfectly and made it very comfortable to sit outside in 40 degree weather. It looks very modern and sleek. It was fairly easy to assemble together. The seats are very firm and comfortable. The weight is light too, so it was easy for 2 people to move the items around to arrange them. Only thing, I wished that fire table had a high glass to surround it to protect the fire from blowing due to the wind. Otherwise, it is very nice set. Very happy with the set. Great addition to our patio. One complaint...was not clear that the LP tank does NOT store inside the fire table so there is a cord running a few feet across the deck. While it's called a "tank holder", we didn't realize it was actually the side table that holds the tank. BUt overall, very happy. We love this modern & sleek looking set. It was easy to assemble together. The weight is light & the seats are very firm and comfortable.The fire table comes with a cover. Overall we are impressed with the quality of the entire set. This is a great dining set that is comparable to much more expensive sets from other retailers. I have received several compliments. The fire table is an amazing accent to the patio and is very easy to use and maintain. One complaint is that the flames are rather weak even on the maximum setting. Clean and modern-and not wicker! 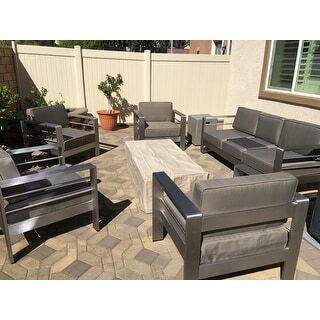 We love our new set of outdoor patio furniture. The only thing we have yet to figure out is why the propane tank for the fire pit has to be close enough and you have to cover up the cord somehow. Great quality, perfect fit, love it! We love this furniture! It is modern, comfortable and stylish. 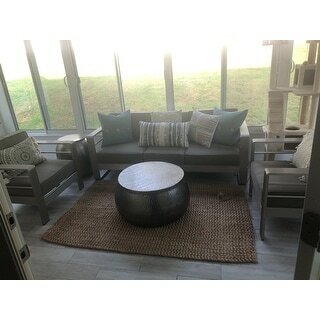 We also purchased an additional sofa and placed half of the furniture in our sunroom and half on our deck. Love. It. It was very easy to assemble and nice quality. Only down side is the red lava rock that comes with it. We replaced it with glass... beautiful! We just added this set to our deck out front. We love the modern look although our house is more farmhouse themed. It still fits very well! Good quality, easy assembly and fast shipping! We love this set! It’s sturdy yet lightweight so it’s easy to move. Beautiful set of furniture, came packaged well and no damage to any of it. Cushions are very hard but i prefer that to them being flimsy. Shipment came in a few days after ordering. "What size propane tank fits in the tank holder? What is the largest tank it will hold?" This is designed to hold a 20 lbs. tank. "Where can I buy the covers for this set? " Unfortunately we do not sell replacement covers for this item. "Can I order this set with the Sunbrella cushion fabric? Thanks"
"Will this work with a propane tank? " Yes, the fire pits are designed to work with propane tanks only. "Are the cushions quick drain? They will be totally outside in an RV park so wondering if they must be covered, treated or leaving alone ok?" No they are not quick drain. "Can the stones be changed in the firepit?" The firepit has only been safety tested with the lava rocks provided.